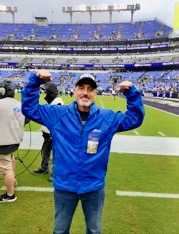 Last Sunday for the Ravens vs. Broncos game we had the honor of helping a patient cross off a bucket list item of theirs. Let me bring you back to the beginning…]We were contacted about a man who is currently going through pancreatic cancer, has completed chemo and will be going through therapy and radiation. One of his dreams was to be on the sidelines of a Ravens game. 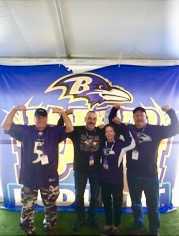 Thanks to our board member Paul D’Amore Zaching was able to provide him with 4 tickets to the Ravens/Broncos game and 4 tickets to Back Yard Bash. Still eager to get him on the sidelines we got in contact with the Ravens Community Outreach who provided a sideline experience during the warm ups and Ravens staff came to his seat and dropped off some Ravens swag. Zaching also provided a parking pass. A social worker has recently come to us regarding a patient who has stage four oral cancer and can only eat tube food. He is experiencing financial issues while being unemployed and cannot pay for the proper nutrition needed. His main source of nutrition is Jevity which his insurance does not cover. Zaching Against Cancer has been requested to supply him with 3 cases of Jevity to hold him off while he awaits for medicaid coverage. A social worker recently approached us about a patient who has endometrial cancer. She has not been able to work since the beginning of 2018 when she was diagnosed. Her husband is her main caregiver which has resulted in him not being able to work as often. These circumstances made it very difficult for them to pay rent and utility bills which lead them to being evicted. The couple was staying in a motel the night that we were contacted and were planning on staying in their car for a few nights while they figured out living arrangements. Zaching Against Cancer was able to provide this couple with 5 nights in a hotel room along with a free hot breakfast until they got their living arrangements secured. A social worker has come to us concerned about a cancer patient who has been having weight loss issues. This patient has continued to lose a lot of weight and financially is not able to buy much for himself. He is a retired fire fighter and has recently been helped to get an apartment after previously being homeless. By having financial assistance this will increase the patients ability to eat. Zaching Against Cancer was able to provide him with a Walmart gift card to purchase food. A social worker brought to our attention a patient who was recently diagnosed with stage four prostate cancer. We have also come to find out his wife has brain cancer, he has a child who is autistic, and to make matters worse he just lost his job. This patient has been having a lot of concerns about caring for his family and how he is going to continue to provide for them while being unemployed. Not only is he unemployed but he does not have family and friends that are able to help him provide for for his family. He is too ill to find a new job at this time and is experiencing financial limitations. The social worker has requested a gift card to Walmart for him to use on food and other essential items. A social worker has recently notified us about a married couple who unfortunately both have stage 4 colon cancer and are going through chemotherapy. They are experiencing a lot of concern due to their finances. In order to receive their treatment they are driving from Pennsylvania to Maryland which is costing them a fortune in gas expenses. Their social worker had requested a gas gift card which we were able to provide to this lovely couple. Recently a social worker came to us regarding a patient who was diagnosed with stage 3 triple negative breast cancer. She has been experiencing insurance issues which has caused a delay in her treatment. She had recently finished chemo but unfortunately she had an extended hospital stay for pneumonia.She had previously been working as a cook in a restaurant but due to treatment she has been unable to do so. She will be getting her breast cancer surgery followed by radiation which will continue to delay her going back to work. In order to relieve some of her financial burdens we were asked to assist her in paying her rent for the month, which we were able to do. We are so incredibly grateful that we were able to help this patient and make life even a little bit easier on her. Cancer can take a huge toll on every day life obstacles and being able to do a little thing like paying rent can take so much stress off one. We recently had a patient come to us who has been diagnosed with recurrent metastatic osteosarcoma. His medical treatment included chemotherapy, surgery, as well as his leg having to be amputated.With the difficult circumstances he is going through, he is not able to return to work due to lengthy hospitalization, chemotherapy, pain management, and other health concerns. He will also eventually require impatient rehab due to his amputation.